Xiamen is located on the Southeast coast of China and on the west bank of the Taiwan Straits, with a land area of 1573 km² and a sea area of 390 km². Its registered population is 3.73 million. 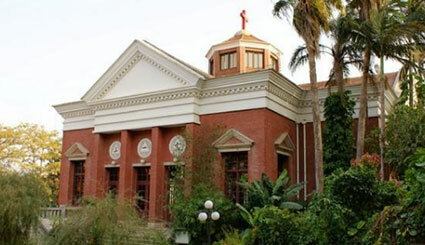 It enjoys mild winter and cool summer with an annual mean temperature of 21ºC. It is one of China’s first Special Economic Zones as well as an international tourist port city on the Southeast coast of China. It has been awarded Nations in Bloom and the coveted UN Habitat Scroll of Honor, hence long been fondly called “the Garden on the Sea” and “the Coziest City”. 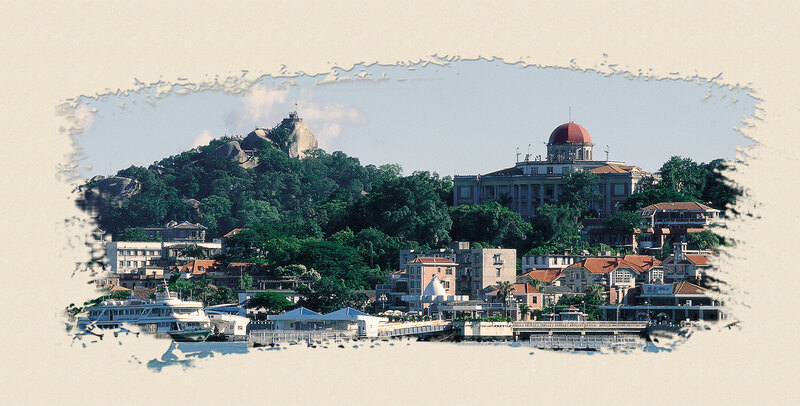 Xiamen boasts a long history with splendid cultural heritage. Legend has it that Xiamen was originally a habitat of egrets, hence the nickname “the Egret Island”. In 1387, the 20th year under the reign of Emperor Zhu Yuanzhang of the Ming Dynasty, the town of Xiamen was built as “a grand Gateway to China”. In 1842, Xiamen was among the first five Chinese ports to open for trade. As cultures of the East and the West converges, Xiamen gradually forms a unique culture of its own by appreciating the two sides. Xiamen enjoys splendid culture, including Nanyin, one of the oldest existing folk music forms in China, and other traditional art forms such as Gezai opera, Gaojia opera, puppet show, chest-slapping dance and etc. As the origin of Chinese tea, Xiamen has everything to do with tea. Actually even the English word “tea” is a loan word from “te” in Xiamen Dialect. Mooncake gambling is a time-honored local custom to celebrate the Mid-Autumn Festival. When the eighth month of the Chinese lunar calendar comes, the sound of locals throwing dice and cheering for the gambling game is heard everywhere. 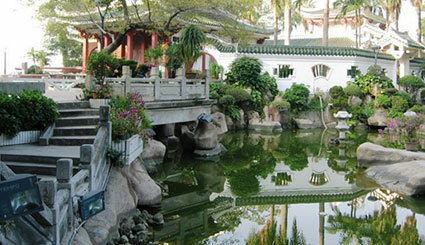 Xiamen is not only a grand land gateway to China, but also a gateway to the Chinese culture. Xiamen, a city on the sea, boasts abundant tourism resources, well established tourism service facilities including over 120 hotels and five pillar tourism product . Gulang Yu is probably the most famous attraction in Xiamen. Get yourself down to the ferry terminal in Xiamen and in just a few minutes you can arrive on the island with the rest of the tourist hoards to stroll and enjoy. This professional piano museum, With ancient pianos from around the world, is the only of the kind in China at present. 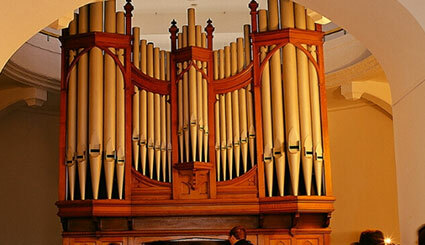 At present, it is the world's largest, and China's only, organ museum, with more than 100 organs, including more than 30 varieties of reed organs, accordions, pianicas and three large-scale pipe organs. Nanputuo is the largest Buddhist temple in the area. The shrines are at the foot of a hill and as you pass through, you slowly make your way up the mountainside. There's a nice park at the foot of the hill in front of the temple itself. After you buy your tickets, make your way through the temples and follow the path to the top of the mountain if you wish. The rock formations are interesting and you can join the worshipers in trying to throw money into the rock carvings. The shrine grounds connect with the Botanical Gardens so you can make quite a day of it. 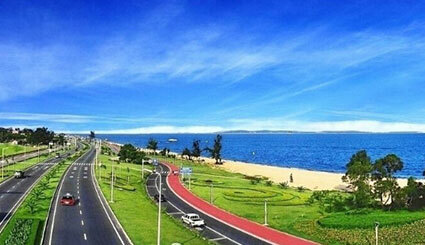 The colored Sightseeing Path on the way of Huandao Road flies like a colorful ribbon along the beach. In addition to facilitating transportation, the path itself is a wonderful attraction. Hulishan Fort was built in 1894 (the 20th year of the reign of Guangxu Emperor of the Cling Dynasty),and covers more than 70,000 square meters. Located at the Hulishan seashore, on the southern tip of Xlamen Island, the entire Fort is of a bunker-shape and combines European and Chinese styles of the Ming and Qing Dynasties. This 85 hectares park is known as the "green lung" of the city. Egrets fly and Black Swans swim comfortablely in this important stop for migratory birds. Known as the 'first garden-style open-air hot springs resort in Fujian Province, it includes the Rlyuegu Hotsprings Park scenic area and five-star tourism hotel. Visitors can freely enjoy theeffKaoes of various hot sptr s and relax physically and mentally. 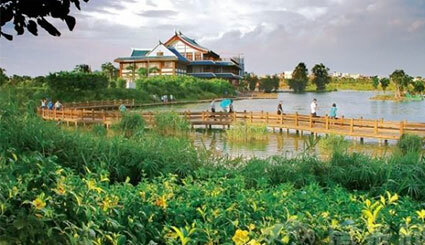 Yundang Lake is an internal lake covering 1.7 square kilometers. Bailuzhou is situated in the center of the Lake. Flowers, green trees, grassy lawns and winding paths complement the strikingly modern architecture. Located at the north gate of Jiageng (Mr. Tan Kah Kee) Park, the museum centers upon more than 250 pictures and 310 cultural relics and material objects. It is divided into 4 exhibition halls and systematicafy introduces the lifetime of Mr. Tan Kah Kee. The night trip along lujiang Rrvrr Is mainly to visit the night scene cultural protect of west Xiamen Sea, featured by mountain, sea, bridge and city. One of the deepest natural harbours in the world, Xiarnen port faces the East China Sea and is adjacent to the Taiwan Strait. Put into service in October 1983. Xiamen Gaogi International Airport is but 10 kilometers from downtown Xiamen and just under an hour's drive to Quanzhou or Zhangzhou.The airport hroughput of international passengers and cargos has ranked in China's top five for many years,making it a pivotal aviation hub in Southeast and Northeast Asia. Located in the central core of the city, Xiamen Railway Station was constructed in 1957, and gives access to all major cities in China.Xia Men entered a new high way age with the Multiple opened between XiaMen and FuZhou in April 26,2010. Southern Chinese cuisineand northern dishes, Chinese flavor and Western style, snacks and feasts-you name it, and Xiamen has it. With over 100 years of history, Nan Putuo vegetable dishes are unsurpassed in the world-neat, elegant and original, grasping the essence of Buddhist secrets of health preservation. 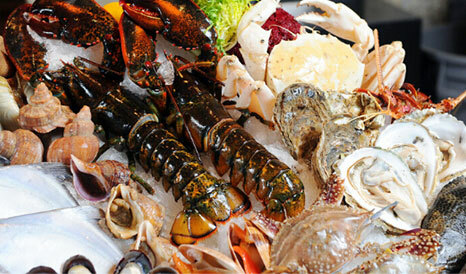 Boiled prawn, fried green crab, steamed fish, pan-fried oyster with egg, scrambled squid,fried eel and so on, seafood predominates Xiamen's famous dishes. You can learn about the unique folklore of a place by tasting it,local snacks, which in Xiamen include hot meat glutinous rice wrapped in bamboo leaves, noodles In barbecue sauce, peanut soups, and other local snacks' whose taste linger on the tongue.You'll enjoy yourself so much you may forget to leave. 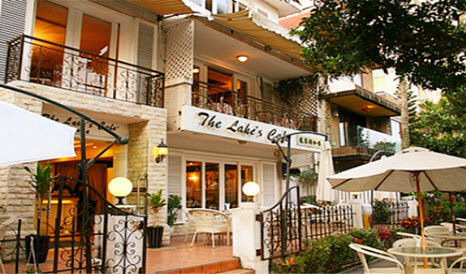 With its exclusive lakeside views and waterside tables, Coffee Street, which was built on the south bank of Yundang Lake in May, 2008, is"Natural, cultural and elegant'. 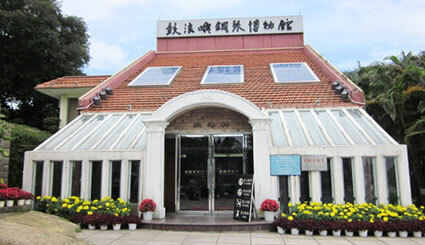 Xiamen was the first port for tea export in China and tea tasting is a key element of Xiamen citi erW life and culture. They are particular about their tea (they prefer Anxi oolong tea) water for brewing tea" tea sets, heating caurol and the artistic layout of the ceremony. 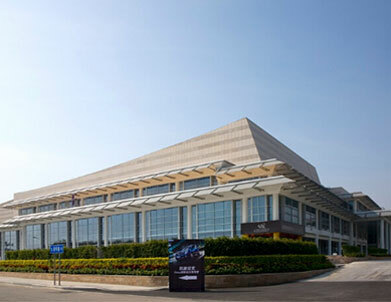 Xiamen has become a domestically and even internationally famous city of conferences and exhibitions.Every year, various large-scale expos, conferencesand shows are held in Xiamen. 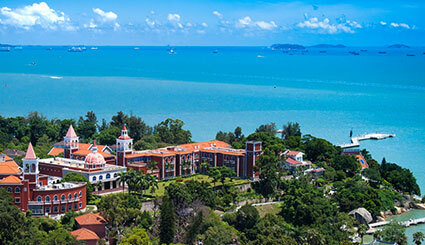 Firsphase&Second-Phase Exhibitwn Halls of Xiamen International Conference & Exhibition Center and Xiamen International Center are situated off the southeastern coast of Xiamen Island, only 4.600 meters away from the Small Kinmen Island,across the sea, as the crow flies. With picturesque landscapes and convenient transportation, they are the top modern conference and exhibition hass in China. 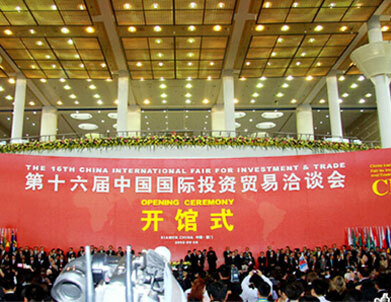 China International Fair for Investment & Trade (Fair for Investment & Trade, or CIFIT) is hosted by the Ministry of Commerce of the PAC and jointly undertaken by Fujian Provincial People's Government and Xiamen Municipal People's Government. Held annually from September 8 to September 11, CIFIT is the only national promotion event focused on attracting international investment and primarily targeting the introduction of direct foreign investment. 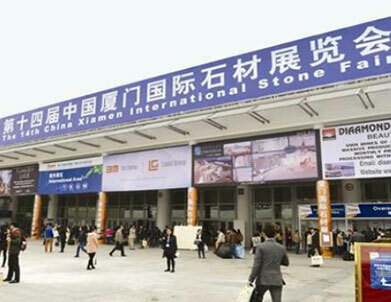 After eight years of nurturing the market, this fair is now ranked at one of the top 3 global professional stone fairs and the biggest international stone fair in Asia. 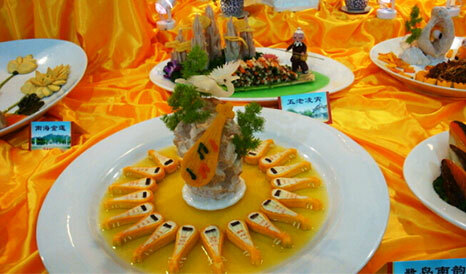 It is held yearly at the beginning of March in Xiamen. Every Year. on the first Saturday of January, along the Xiamen Island Ring Road the most beautiful of Its kind in the world. This is Xiamen's most unique and Interesting traditional cultural activity held during the Mid-autumn Festival. The 4th World ChoirGames (formerly the 4th Internat ional Choir Olympics) is a choir contest of the highest grade and level organized by the Internat ional Cultural Exchange Foundation. Xiamen Little Egrets Folk Song and Dance Troupe, established in 1993, has been well received by dicks with its thick performance style of Chinese folk dance and unique local characteristics of southern, Fujian. 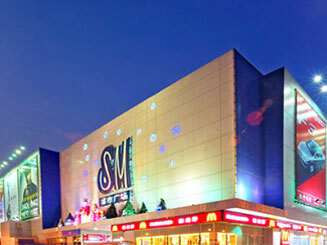 Situated at the foot of Meiren Mountain with the pleasant scenery in Tong'an District. 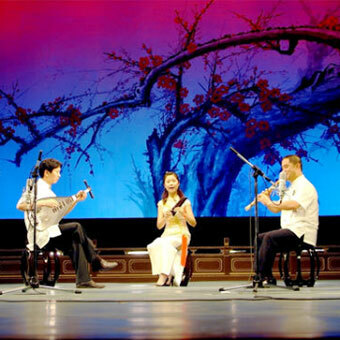 Also known as Southern Melody, Southern Musk and Southern Opera, Nanyn was created during the Han Dynasty (206 B.C. to 220 A.D)and Tang Dynast, and thrived during the Mng and Qrsg Dynasties, and now has the reputation of "living fossil of music’’. 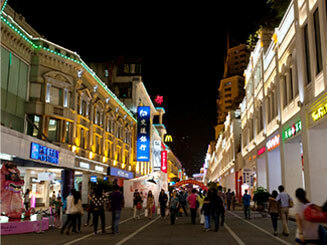 As one of the Yhinese Top 10 Famous Streets' Zhongshan Rd.is a special business-oriented pedeslnan street. SM City Square intergrates each aspect of modern city life and leads the new trend of bne-stop' shopping, entertainment and food courts -the quintessential essence of city life. 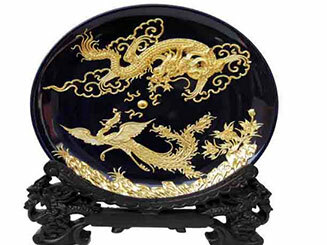 Xiamen's oldest folk handicraft, the reputation of lacquer-thread sculptures at home and abroad reaches back over three hundred years. You'll enjoy the picturesque natural sceneries of Fjianafter taking a pleasant trip to the whole Fujian. As a national AAAAA scenic spot, the wonderland of Wuyl mountain boasts spectacular green waters framed by red mountains, an irirgact central subtropical zone ecological system, and the the long-standing culture of Fujlan Provlncds ancient Vue minority. Wuyl Is also recognized as the World Cultural Heritage Site and the World Natural Heritage Site. The mysterious FWlan eathen buildings are a peal inlaid in the akntal CMI Zatan and feature tong history, unique st)4 large scale, eagsaisae mucture. etc most earthen bungs are round or sgwre. she round earthen bu:kimg bekg most representative d the Hakka culture. They also san be seen in Zhan thou and Longyan. 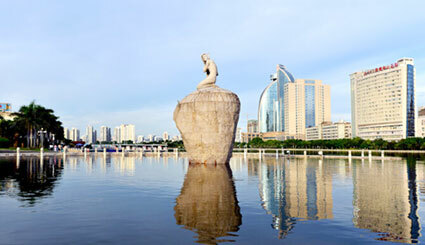 Quanzhou has a long history of more than 1,700 years. 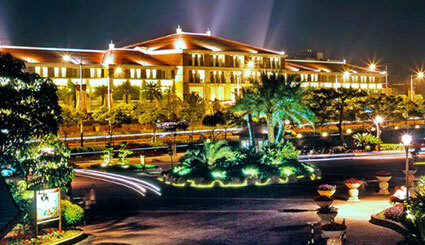 Quanzhou is a famous historical and cultural city and hometown of overseas Chinese. It Is also a well-known port, and during the uan Dynasty (1271-1368) was the largest oriental port, and the starting point of the Maritime Silk Route. Tour the picturesque island-ring road, Guanyin hill, impregnable Hulishan Cannon Fort; In the afternoon, visit music isle-Gulanyu Isle. After dinner, tour Zhongshan Road or the coffee and bar street. In the morning, visit CIGF Expo Garden, which is the major place of the 6th China International Garden & Flower EXPO. In the afternoo visit beautiful university village in Jimei and Tan Kah Kee's Former esidence. Go to Zhangzhou. In the morning, visit Flower Expo Garden and Coastal National Volcanic Geological Park in Zhangzhou, with its marvelous volcanoes and oceanic culture. 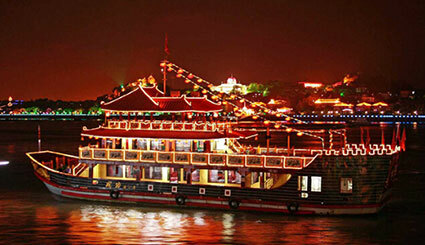 After lunch, go to Quanzhou, the start of the maritime silk route. On the way, drop by the Cai family's ancient houses, which are representative of red-brick buildings in southern Fujian. In the morning, visit Kaiyuan Temple, the biggest temple in Fujian, then see China's largest statue of Laotzu Qiangyuan Mountain. 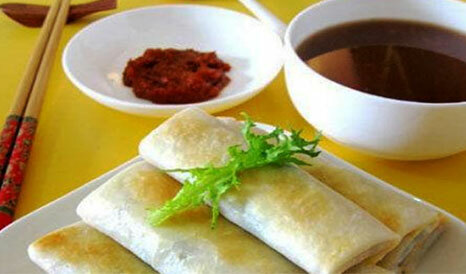 Sample Quanzhou's local delicacies, and in the afternoon, visit the China Museum for Fujian-Taiwan Kinship. 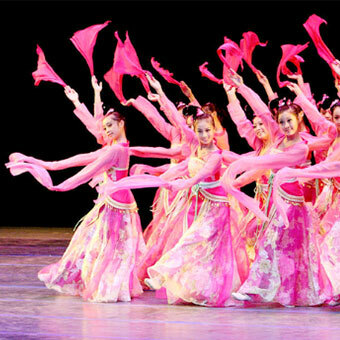 Go to Chongwu city to appreciate Hui'an women's costumes and and charm. Go to Putian by bus and visit the Chinese arts and crafts Putian City. In the morning, go to Meizhou island to make a pilgrimage to Matsu, the sea goddess. 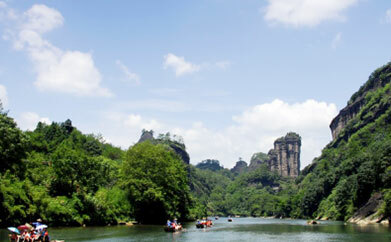 Listen to the music of Meizhou Island'' waves, and visit the Amazing Rock Park in Erwei Moutain. After lunch, go to Mawei and visit Mawei's Ship Culture Theme Par$ (Memorial Hall of Majiang Sea,9attle and Museum of Ship Culture), which is known as `Cradle of Modern Chinese Navy'After dinner, enjoy the hot springs in Fuzhou, or travel on the Min River in the evening.3. After breakfast, visit Xianying Palace in Zhang an Town, Chan Ig e. City. Return. Visit Dahongbao (BigRed Robe Tea) Scenic Area, Chinaware kiln site in Yuling Pavilion and vast tea base; Visit Yongsheng Oolong Tea Factory, the demonstration site for national agricultural tour, and watch the process of making oolong tea; visit Xiamei, the start of tea road to soutnern Shanxi Province;taste Dahongbao((Big Red Robe)tea and dine on tea food; appreciate a traditional tea ceremon ; fly to Xiamen in the evening. Go toTianfu Tea Museum in Zhangpu; visit Tianfu Stone-carving Park; go to Anxi County. Visit the origin Tieguanyi Tea; Tea Market of China Tea Town, and Grand Garden of Tea in Fengshan; tasteof Tieguanyin Tea, enjoy a traditional tea ceremony, go to Xiamen by bus. Visit beautiful island-ring road, Guanyin hill, impregnable Hulinshan Cannon Fort; in the afternoon,visit Gulanyu isle, the music isle. After dinner, shop and relax on Sun Yat-sen Road or the coffee and bar street. in the morning, visit CIGF Expo Garden, the major place of The 6th China International Garden & Flower EXPO, and the first Olympic Museum. 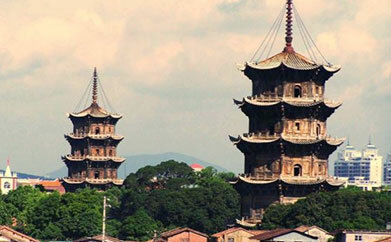 After lunch, fly to Wuyishan,the UNESCO World Cultural and Natural Heritage Preservation Site. 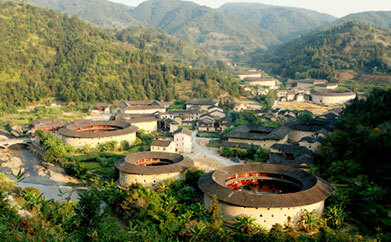 Visit Dahongbao (Big Red Robe Tea) and Water-curtain Cave Scenic Area. 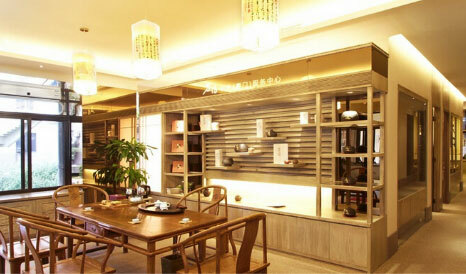 In the evening, appreciate the performance of tea culture and taste Wuyi Oolong Tea. Visit Zhaixia Great Valley and tour the special Jinhu Lake [Grand Golden Lake], with its Karst peaks and Geography Park; after dinner, visit the ancient town and street and the residence of the director of military ministry during the Ming Dynasty. After breakfast, go toFuzhou; tour West Lake Park and Panda World, which is the only institute for research, education, sightseeing and protection of pandas.After dinner, tour the Min River or Riverside Park in the evening. After breakfast, visit Mawei's Ship Culture Theme Park (Memorial Hall of Majiang Sea Battle and Museum of Ship Culture), famed as the "Cradle of Modern Chinese Navy", and Xianyin Palace in Zhanggan Town, Changle city.Return. Visit the first Olympic Museum,the beautiful Island-ring Road, Guanyin Hill and impregnable Hulinshan Cannon Fortress;after dinner, experience the garden-style hot springs in Sun Moon Valley. 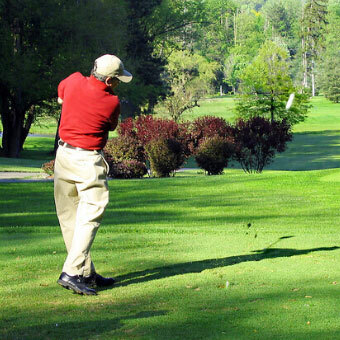 Go to Dongfang Golf Course or Kaige Golf Course;in the evening, fly to Wuyishan, the UNESCO World Cultural and Natural Heritage Site. In the morning, visitTianyou Scenic Area; In the afternoon, tour iJiuqu River on bamboo rafts; and then fly to Changle. 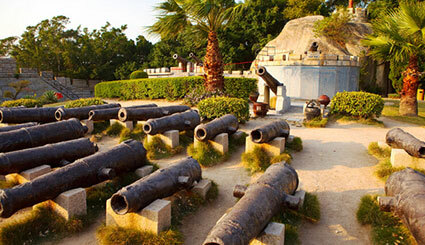 Visit Drum Mountain, Mawei Ship Culture Theme Park (Memorial Hall of Majiang Sea Battle and Museum of Ship Culture),famed as the "Cradle of Modern Chinese Navy"; Returnd as the "Cradle of Modern Chinese Navy", and Xianyin Palace in Zhanggan Town, Changle city.Return. Jinmen, a place baptized in war, has a group of unique battle-field scenes. After decades of military control, the traditional culture here is well preserved. Pick up at the airport, ferry to Gulanyu Isle (Garden on the Sea) and view Zheng Chenggong's statue on the way; in the afternoon, visit the time-honored famous Nanputuo Temple, the Hulishan Cannon Fort,and Huandaolu (Island-ring Road),the Route of Xiamen International Marathon, known as the"Oriental Hawaii, and check in at the hotel. At 8:00 am, gather at the designated spot in Xiamen and go to Jinmen by ship (about 50 minutes); passing Dadan Isle and Erdan Isle on the way to Jinmen. Visit Juguang Building, the landmark of Jinmen; then tour Sun Yat-sen Memorial Forestand its Rushan Fortress and a display of fightin9 planes and military vehicles; overlook the Xiaojinmen and.Lieyu Isles. After breakfast,fly to Taipei and visit the National Palace Museum,which houses over 640 ,000 cultural relics, over 5000 of which are displayed at a for each exhibition. After lunch, go toTaichung and visit the Zhongtai Buddhist Temple,which combines eastern and west architectural elements and is a holy place for Buddhists. And then go to Sun Moon Lake. After breakfast, visit Sun Moon Lake Scenic Area, Taiwan island's largest lake; enjoy the lake's beautiful scenery with a boat tour; visit Men Mo Temple, Xuanzhang Temple and Ci'en Tower. Then go to Alishan National Scenic Area where you may enjoy a forest bath, and view many beautiful scenes, such as the Divine Tree on Ali Mountain, the Three-generation Tree, the Sea of Clouds,and Sisters Pond, on the way you may appreciate the pleasing gardens and beautiful flowers and taste free Ali Mountain tea. In the morning, go to Tainan to visit the historic relics of Yanping King's Temple, traditionally known as Zheng Chenggong's (Koxinga's) Temple. Then visit Chikang Building, a key attraction in Tainan, which has witnessed the rule of the Dutch in the mid-1600s, Zheng Chenggong (Koxinga) during the Ming Dynasty, and the Qing Dynasty, and boasts great historic and culture value. After lunch, go to Kaohsiung by bus to visit Foguang (Buddha's Halo) Hill, which is one of four famous Buddhist hills in Taiwan. Then head for Xizi Bay and visit the British Consulate at Takao, which was built in 1858 and was the first foreign consulate in Taiwan in the Qing Dynasty. View Kaohsiung harbor, and after dinner, shop in the Liuhe Night Market and taste local snacks at your own expense. In the morning, go to the Tropical Scenery Zone, in Kenting National Park, and Erluanbi Beacon. Maubitou Cape is the cut-off point separating the Taiwan Strait and the Bashi Strait. Maubitou Cape and the Erluanbi Cape are the two most southern tips in Taiwan. Through Nanhui Highway, go to Taitung's Chihpen Hot Spring Holiday Resort, the famous homeland of hot,springs. Check in at the hotel of the resort and enjoy a soak in the hot spring (remember to bring your swimsuits). After breakfast, go to Hualian via the zigzag Huadong Highway on the cliff to visit the Tropic of Cancer and the marvelous stream that flows upwards. On the way, drop in at Baxian Cave and Sanxiantai Isle. After lunch, tour the renowned Taroko Gorge National Park (Eternal Spring Shrine, Swallow Grotto, Tunnel of Nine Turns). Taroko is well-known for its high mountains and deep gorges, especially Liwu Valley, where a highway in its central part traverses the gorge from Taroko to Tianxian; with beautiful marble rock formation's framing each side. And then visit the Marble Museum. After breakfast, fly to Jinmen,and take the ferry to Xiamen. Depart from Xiamen airport. After breakfast, walk upTaiwu Hill and ejoy its stone rabbits, stone turtles, Haiyin Temple, and the place where Zheng Chenggong (Koxinga) and his underlings played chess. Then go to Rushan Tourist Center, where you may watch and experience a simulated battle, and view fighting planes and fighting vehicles. 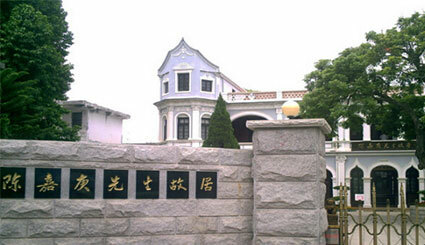 Visit the Zhaishan military tunnel, Shuitou ancient village and the museum of overseas Chinese. After lunch, go to Shuitou Wharf and udergo customs formalilties; return to Xiamen. 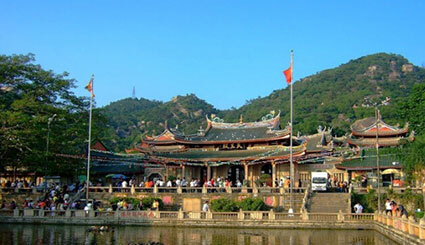 Visit the time-honored Nanputuo Temple and appreciate the scenery of Xiamen University. After breakfast,visit Hulishan Cannon Fort or the Earthen Buildings,which are a UNESCO World Heritage Site. End with departure from Xiamen airport.